Vacation condo rentals from Dunes of Panama feature gulf-front two and three bedroom units overlooking 1,500 feet of prime beachfront. Lush tropical landscaping enhances the already tranquil atmosphere of this Panama City Beach resort-style vacation setting. Enjoy stunning views of the glistening white beach sands and the emerald green waters of the Gulf from your private balcony. Each condominium is tastefully furnished and decorated to suit a wide range of preferences. All condos include a fully equipped kitchen, dining area, living room, two baths, private bedrooms, towels and linens, washer and dryer, and cable television with HBO and DVDs. An on-site office and on-site security add to your convenience. 2 Fire Pits – 1 at the B & C building pool and 1 at the E building pool. Meeting room pool side (Capacity 40), Meeting room E bldg (Capacity 20) available for rental. On the Dunes property we have a wireless internet hotspot, and meeting facilities are available for rental in *Mid Spring, *Late Spring, *Fall and *Winter. On property E Pool Deck, enjoy the convenience and eclectic decor of a charming little shop known as Suds Weezers Beach Store & Deli, a family operated store serving deli sandwiches, pizza, ice cream, snacks, smoothies, gift and convenience items, beer and wine, and lots more. They also have introduced their new funky little beach hut called the Sneaky Tiki conjuring up more delicious frozen concoctions and snacks at B&C pool deck. If you’re seeking moderate activity, shuffleboard will be perfect. 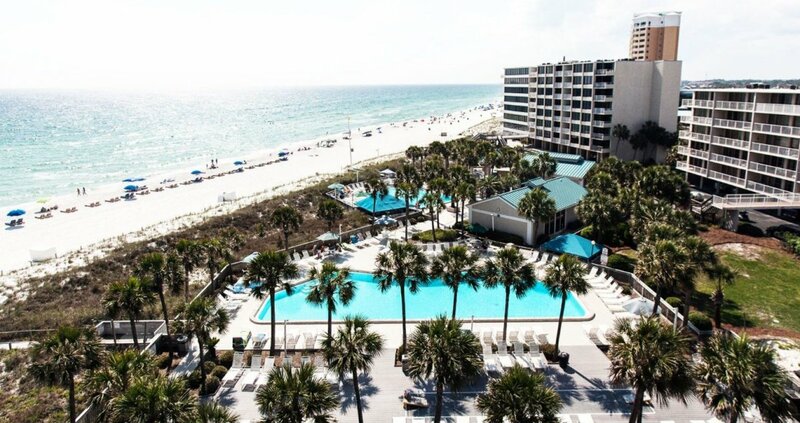 For the ultimate in relaxation during your Panama City Beach Florida Trip, beach chairs and umbrella rentals are available so you can just sit and watch the best that nature has to offer at this Florida beach resort. From dolphins, pelicans and seagulls to spectacular sunsets, it’s all here waiting for you. Year after year the Dunes of Panama on Panama City Beach has been a favorite Florida Tropical Vacation Destination for countless guests. If you have not yet had the pleasure of experiencing the Dunes, let us welcome you to your new Florida beach vacation home. You will definitely enjoy the magnificent view of the Gulf of Mexico from every room. Year after year the Dunes of Panama on Panama City Beach has been a favorite family vacation spot and FL Tropical Trip for many and we welcome you home. For those who have not yet had the pleasure, what are you waiting for?